Activity for children 0-5 years old. 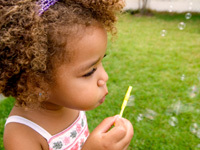 Use everyday activities to encourage children to count and calculate. Count stairs when going up or down them, count how many cups are needed for teatime, count how many girls for tea and how many boys. This activity will help children to notice changes in groupings of objects, working towards helping with problem solving, reasoning and numeracy. Say some counting names randomly. Use own methods to work out a problem. Children don’t get the counting right straight away, but encouragement goes along way in helping them associate with quantities. We even see some of the very young children following the counting rhyme, pitch and tone by trying to copy some of the older children. 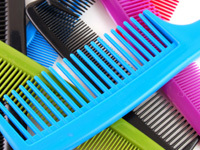 Equipment needed: chair, empty shampoo and conditioner bottles, towels, brushes, mirror hairdryer, paper, pens and telephone. Create a role play area as hairdressers, book appointments and write them into a book taking turns, then wash each others hair and style. Talk about different colours cuts etc. This activity will help children use language as a powerful means of widening contacts, sharing feeling, experiences and thoughts. Examine the marks they make and make. Taking turns with you being the customer and hairdresser with you child is exactly what they do with their friends at the Red House. You won’t be able to help smiling when they tell you you’re doing it wrong! All of this is helping with communication, language and literacy. We all finding singing fun at the Red House. Of course we sing lots of nursery rhymes, however we also find children asking to sing parts of songs they’ve heard on the radio at home or in the car. Sing songs and talk about the body eyes, nose, and mouth etc. Point to facial features encouraging babies to point to theirs too. Song ideas include row, row, row your boat, this little piggy and round and round the garden. This activity will help babies to make sounds with their voices in social interaction. Understand simple meanings conveyed in speech. Listen to familiar sounds, words or finger plays. In singing songs we are helping children with communication, language and literacy. Equipment needed: mirrors, pencil crayons and paper. Sit with your child and talk about different features of your bodies, use the mirrors to explain about different features and expressions we use. Talk about how you feel and ask your child how they feel, pull different faces and say what makes you happy, sad, excited, angry, cry, laugh etc. Finish activity by drawing a picture of how you feel. Help them to show their particular characteristics, preferences and interests and find comfort in touch and in the human face. This activity will help to develop an understanding and awareness of themselves and helpswith personal, social and emotional development. You may find your child has picked up new words and names while they’ve been with us at the Red House. Activity for children any age. Clearly the older the child the more understanding they have of the story, however it amazing to see even very young children become attentive during story time. Activity for children under 2 years. Equipment needed: pans, plastic cups, card, cello tape, radio. 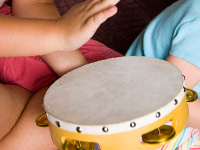 Make a music session for babies to make music using household items. Babies can bang, shake and dance to the music. We know it’s always a pleasure to see your baby dancing and we see the babies at the Red House copying their friends their own age as well as some of their older friends from our toddlers group. I am sure you will see your baby copying some of the simple nevertheless enjoyable and in time with the beat to your baby. This activity will help your baby to anticipate repeated sounds and actions and explore the space around them through movements of hands and feet and by rolling. Activity for children 2 years and over. 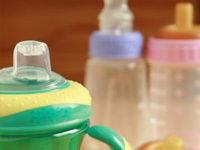 Equipment needed: large bowl, washing up liquid, plastic toys, jugs, sponges, dolls, and cutlery. Fill the bowl with water and let your child see you add the washing up liquid to see the change and the bubbles appear. Add different objects and use as role play your child can pretend to wash up, pretend to bath the doll, or just play. The children often play together in this activity talking to each other and helping each other. We have to admit the bubbles is their favourite part and we’ve seen them make beards, bubble hats and snow when we’ve observed. We’re sure you’ll see some of this at home. This activity will help your child take pleasure in learning new skills, talk freely about their home and community and talk activities through reflecting on and modifying what they are doing. Equipment needed: tray, tin of spaghetti, spoons and cups. 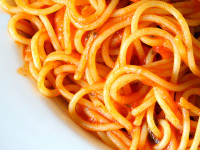 Simply pour a tin of spaghetti onto the tray and let your baby explore using hands, spoons and cups. We have some fantastic photos we’ve been able to give to parents of their own child when they’ve been involved in messy play. We’ve seen parents in fits of laughter and astonishment at what their children have been up to during the day when we show them the results of this activity. 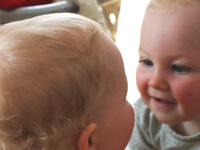 Babies will use their senses during the activity by touching, tasting, smelling, seeing whilst they play. Babies can use the cups to fill and empty with spaghetti. Babies will develop their skills, explore objects and materials with hands and mouth and become absorbed in putting objects in and out of containers. Activity for children aged 2 and over. Equipment needed: chalk, ball, empty box and a small bin. 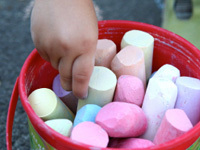 Using chalk you can create an activity course. Parents have told us when they try this at home their child often wants to draw the course themselves having a sense of responsibility and happy in demonstrating that they have done this before at nursery. Cut out an empty box for crawling through. Draw feet on the floor and encourage children to draw them to, as you draw them count along the way. Draw goals to kick the ball through then throw the ball up and see how many times you can catch it without dropping it. Crawl through the box using it as a tunnel then throw the ball into the bin to complete the course. You can repeat this activity and time it to improve your child’s speed. When we play this at the Red House, although it doesn’t really get competitive it is a real pleasure watching the children encourage each other and taking pleasure from everyone’s success and usually laughter when our carers fail. This activity will help to develop self confidence and feel proud of their achievements. 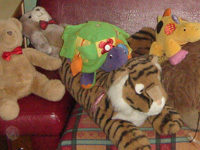 Equipment needed: soft toys and a soft surface. Create a safe and comfortable area for you and your baby to play. During the play session you can sing songs for example row, row, row your boat, see saw margery daw and round and round the garden. You can also play games such as peek a boo using the soft toys to hide behind. Also encourage rolling over to reach for the toys. 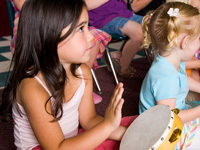 Use musical toys to encourage interest and exploration. We have often seen babies start to make friends by attempting to play similar games with each other at The Red House. This activity will help to develop their skills, learn that experiences can be shared, enjoy company of others and be sociable.